My beautiful and shapely wife loves to cycle. It helps to maintain her youthful figure. She looks so young that whenever I ride with her, people commented; “Bagusnya bapak dia, temankan anak dia kayuh basikal.” (Very good of the father, to accompany his daughter cycling). Keeping her company during rides was not a problem except during Ramadan since we can only start riding after 10 p.m. due to tarawikh prayers. Turning in at midnight, waking up at 4.30 a.m. for sahur was not a good idea, since I would be walking like a zombie the next day. In August 2010, with Ramadan approaching on 11th August 2010, I decided to buy a bike trainer for her as our 19th anniversary gift, then that she could continue to ride during Ramadan. 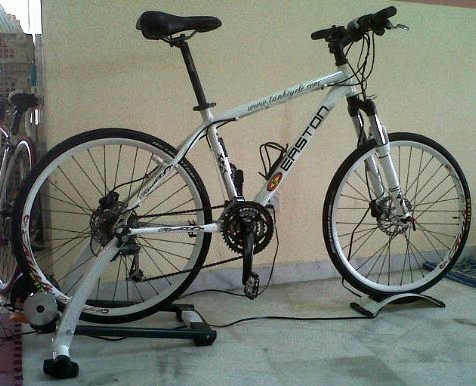 A bike trainer allows you to ride your bike without having to venture out into the dark night or during poor weather. TacX Fortius VR Trainer with Video Reality and VR Software (iMagic). One of the BJCC riders (Boon Foo’s best customer!) bought the iMagic model for just above RM4000 in June 2010. Although the review sounds impressive, it was way beyond my measly budget. So I opted for the second model, TacX Flow. Later once I could afford it, I could buy the PC Upgrade which would turn the TacX Flow into the iMagic model since both utilises a similar turbo trainer. Only the interface/software is different between the two models. Another TacX trainer model which could also be upgraded into the iMagic model is the TacX Cosmos. 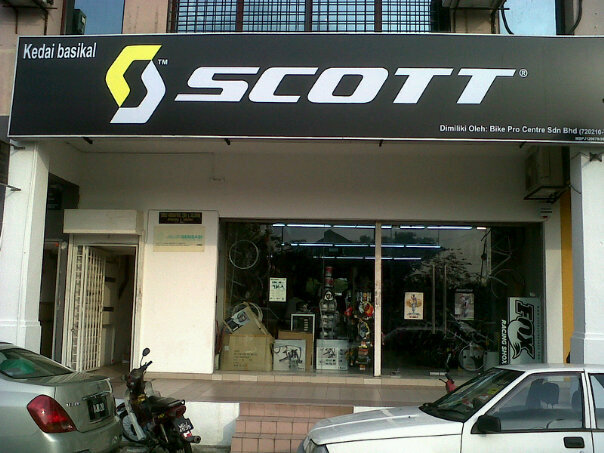 So I went and bought the trainer from Boon Foo’s Pro Bike Shop on the 6th August 2010. Initially I got lost since I didn’t know that his shop moved just before the 2010 PCC Interstate Ride. With guidance from Prof Sani via phone, I found Boon Foo’s new place (N3.11645 E101.61259). Setting it up was easy once I learnt to ignore the instructions in the manual. Instead I relied on the images in the manual instead. For the bike, you only need to change the rear wheel skewer with the supplied quick release skewer, otherwise your bike will fall out of the trainer. It was easy to put in and take out the bike due to the quick release on the trainer. Fitting the cadence sensor,head unit display and assorted wires was a bit messy though. A wireless system (like TacX Bushido!) would be a nice change. Once up and running, the Flow is smooth and quiet, and the frame felt stable with no wobble even at high speed. To ensure quiet running, I used “road-slick tyre” on the rear wheel. Using a “semi-slick tyre” would cause a weird humming sound. It was so quiet that now I have the trainer installed in my bedroom. My wife could ride it at night and it won’t disturb my sleep at all. Resistance feels good and is more than adequate for training purposes. The head unit is fairly intuitive and the display is large enough to see. The resistance is set based on the gradient or the power setting. You can change the gradient of the ride from minus 4 up to plus 9 (minus for descents, 0 for flat, plus for climbs). But changing it yourself while riding takes the fun out of it. Felt like cheating since you were more likely to change it to 0 once you couldn’t cope with the climb any more. Please note that the resistance is simulated. Resistance +9 does not correspond to an actual incline of + 9 and resistance – 4 does not correspond to a 4% descent. It goes without saying that at – 4 the trainer will not freewheel if you stop pedalling. Or you can set the power setting. Once you set the power setting, the computer will adjusts the resistance on the roller so that you will continually pedal at your original power setting. If you change pedalling frequency or resistance, the computer will immediately adjust the resistance on the roller. You can set the power between 10 and 990 Watt, in increments of 10 Watts. At 100 watts, cycling feels pretty easy once you hit above 25 km/hour. Although the head unit displays the heart rate of the rider, the TacX Flow do not come with a heart rate transmitter. Instead you have to buy it separately. The manual recommended that you to buy the Polar T31 Transmitter/Electrode Belt Set – Non Coded. However my Polar Wearlink Coded HR transmitter that comes with my Polar S725X does work with it. Even the HR transmitter from Cat Eye Dual Wireless Cyclometer & Heart Rate Monitor CC-HR200DW seems to work with it. But my wife’s Polar Wearlink W.I.N.D. HR transmitter that comes with her Polar RS800CX does not work with TacX Flow. It is stated in the manual that the Suunto transmitter belts (ANT) and Polar W.I.N.D transmitter belts are not compatible with Tacx trainers. All-in-all this is an excellent product which is helping to motivate my wife to increase her fitness. The only downside is the boredom whilst training. The most that I could do on the trainer was 25km in one session. A year after buying the TacX Flow, it was very much under-utilised. It was “not fun” riding on the trainer, unlike riding on the road. So to avoid it from becoming a white elephant in my house, I decided to get the PC Upgrade from Wiggle as her 20th anniversary gift. I got it for only GBP180 (RM890) with free delivery. It arrived 11 days after ordering. I just have to exchange the head unit of the TacX Flow with the new iMagic head unit. Then I installed the software on the home computer which is running on Windows XP. I was immediately disappointed. The installation and upgrading of the TacX Trainer Software (TTS) needs to be improved. They should ship it with the latest version of TacX Trainer Software (v3.6). Currently you have to install version 3.0 first, which comes in a CD with the new head unit. Then you have to download v3.1, then install to upgrade. Then repeat the same steps for v3.2, v3.3, v3.4, v3.5 and lastly for v3.6 to finish the upgrading. Why can’t I just download the full v3.6 and install it straight away? The upgrade procedure really needs to be improved. 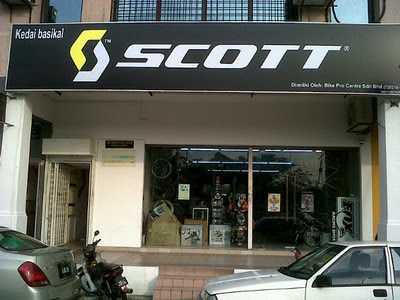 I ended up spending more than RM5.5K, excluding the cost of the bike and internet access. Quite a huge investment, a lot more than what I paid for my wife’s road bike. However riding on the TacX Flow trainer now is so much fun. Catalyst consists of professional training programs for scientific analysis. There are three different program types (slope, watt and heart rate) adjustable for distance (in 100 meter increments) or time (in 10 second increments). Real Life Videos were specifically shot for the Slope/Distance workouts. The film’s speed is influenced by your tempo. When you are riding uphill the brake will generate so much resistance that you can really feel the incline. ErgoVideo stands for power training with the pros in Watt/Time. It’s a very efficient way to improve your fitness and cycling technique over a remarkably short period. Real Life Training – You can upload GPS tracks of your previous rides and ride them again on the trainer. Courses that you have personally ridden can be repeated, thanks to Google Earth. It’s life like, but without the inconveniences of riding outside. With the help of the 3D maps you can also ride courses you would never dream of going to. You can copy a real ride or create one with the route planner. Makes planning and training for rides a breeze. Below is route created from the January 2011 LeTua 100 GPS tracks. The virtual reality trainer is an acceptable mode of training but be prepared to be nauseated due to it’s lack of smooth turning. But to me, the best of all the above is the real life video training routes. It is really fun to ride the video routes. Although the demo version is only 3.9km, everyone who drops by my place, rides it again and again. You can buy the real life video training routes from TacX itself. Each video is around 35 euro which is about RM150. Quite cost effective. For example, it will set you back more than RM15,000 in fare, lodging and guide fees to ride the Stelvio in real life. Forking out only RM150, will allow you to ride the Mortirolo (1.851 m), the Stelvio (2.758 m) and the Passo di Gavia (2.621 m) on your trainer. No need to pack your winter ride clothing! If you check out the forums, there are a lot of comments on the inaccuracy of speed and distance displayed on the TacX trainers. To check it out, I rode a short 16.48 km real life video route and compared it with the distance recorded on the Polar watch. It is possible to compare since I installed the speed sensor on the rear wheel instead of the front wheel. The watch recorded only 13.62 km distance. The speed during ride also varies especially whenever I am going downhill. The TacX Trainer Software (TTS) would be displaying a speed of 50km/hour while the watch was showing a speed of only 20km/hour. This is due to a “software trick” to compensate the fact that the trainer’s roll will not turn by itself during a descent in the terrain, like it would in real life. So the software engineer has introduced “virtual speed formulas”, in order to imitate reality as much as possible the rider’s speed is artificially increased during descents and decreased uphill. As a result of this application the speed indicated on the screen will in many cases be superior to the actual riding speed. This will also affect the actual distance travelled as displayed on the TTS screen. This is explained in the manual. I guess not many users/reviewers read the manual :D.